Evanston Township High School, 1600 Dodge Ave. On Nov. 6, the federal appellate court in Chicago heard arguments for a discrimination case involving an ETHS athlete with cerebral palsy who has asked that the Illinois High School Association create a para-ambulatory division for track and field events. 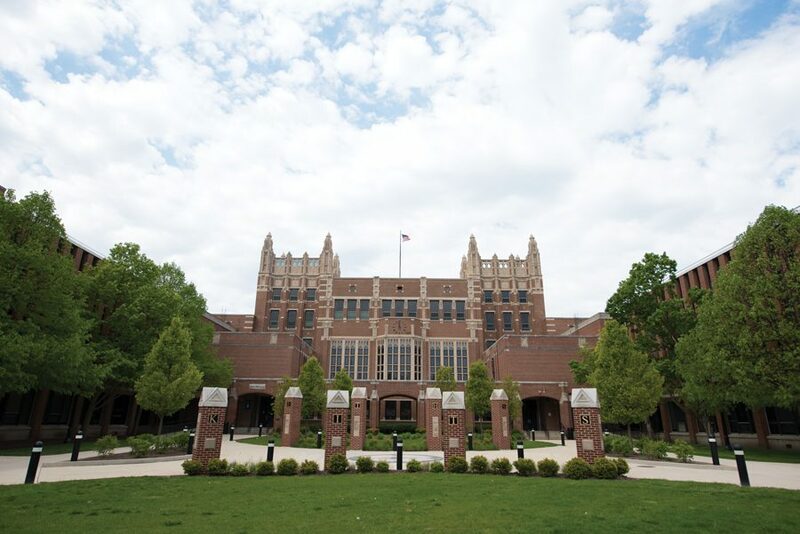 The federal appellate court in Chicago heard arguments Nov. 6 for a discrimination case involving an Evanston Township High School athlete with cerebral palsy who has asked that the Illinois High School Association create a para-ambulatory division for track and field events. Although the ETHS senior — a student athlete who is identified as A.H. in court documents — is considered one of the top para-ambulatory high school runners in the state, he is unable meet the qualifying standards IHSA set for able-bodied athletes. In February 2016, A.H. filed a lawsuit requesting the creation of a new division so athletes like him have a pathway to qualify for the state track meet. In July 2017, a district court judge ruled in favor of IHSA, citing a lack of material facts or disputes. After receiving the verdict, A.H.’s lawyers appealed the case to the Seventh Circuit United States Court of Appeals. Devi Rao, one of his attorneys, alleged in oral arguments Nov. 6 that the IHSA excluded non-wheelchair, para-ambulatory athletes like A.H. from state meets or team competitions by requiring they meet time standards initially established for their able-bodied peers. Rao claimed the association therefore discriminated against athletes like A.H., in violation of the Americans with Disabilities Act. “When Congress passed the ADA, it required that all reasonable accommodation should be granted, and it did so to integrate individuals with disabilities into the mainstream of American life,” Rao said. Rao claimed A.H.’s request is “reasonable” because he is only asking for one new division to apply to all non-wheelchair, para-ambulatory athletes and one qualifying time standard “appropriate for that umbrella.” She said IHSA’s counterparts in states such as California and Washington have formed an ambulatory division for non-wheelchair athletes with disabilities. Currently, the IHSA allows for different qualifying time standards and races geared toward swimmers with disabilities and track and field athletes in wheelchairs, so the association has experience accommodating a range of abilities, Rao claimed. IHSA even conceded that creating a new division would pose no administrative or financial burden, she added. Rao asked that the district court’s order be reversed. Unrath claimed the ADA does not require IHSA to make the accommodation and there has been no demand from member schools — including ETHS — for this new division. Unrath said if ETHS requested the accommodation, the association would turn to other member schools to gauge support before taking action. In addition, Unrath alleged there is no evidence that athletes with disabilities aside from A.H. will benefit from the division’s creation. Judge Ilana Rovner, one of the presiding judges, disagreed with Unrath, arguing other student athletes with disabilities would make use of the new division if it was implemented. She said she didn’t understand why, if there are no costs or disadvantages to other athletes, IHSA doesn’t grant the accommodation. The court is expected to issue an opinion on the case within three months. “For those of us following this case, it is not a question of whether Illinois will adopt a para-ambulatory division for high school track, but when they will do so,” he said.